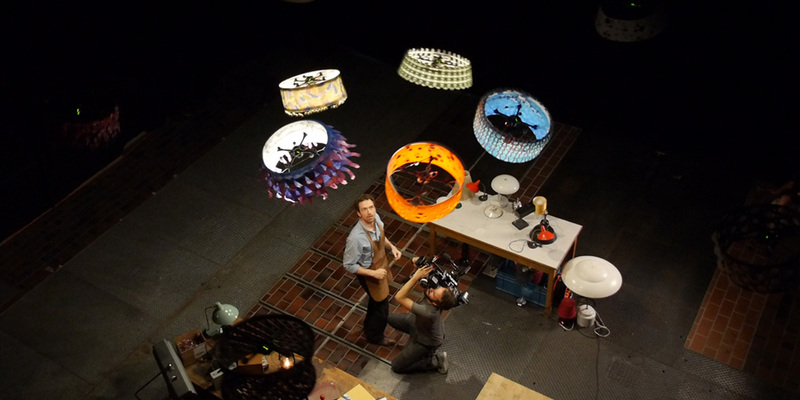 Verity Studios, ETH Zurich, and Cirque du Soleil have partnered to develop a short film featuring 10 quadcopters in a flying dance performance. The collaboration resulted in a unique, interactive choreography where humans and drones move in sync. Precise computer control allows for a large performance and movement vocabulary of the quadcopters and opens the door to many more applications in the future. SPARKED: A Live Interaction Between Humans and Quadcopters was a highly democratic and highly collaborative process. Raffaello D’Andrea of ETH Zurich and Verity Studios, and Welby Altidor of Cirque du Soleil were the project leaders, but the true collaborative nature of this project is reflected in the fact that no participant roles are specified in the credits.